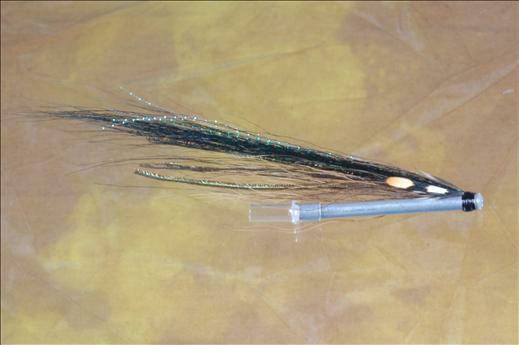 The Sunray Shadow JC is an extremely simple and versatile fly that is extremely good at catching sea trout, steel head and pacific Salmon. Plastic or aluminium tubes size 1/2"-2". Under wing : Brown buck tail or squirrel. Main wing : Streamer hair, natural sheep wool dyed black. Black goat or black arctic fox. Over mainwing : Crystal flash.